I’m very excited to expand my usual Yoga for Athletes weekend workshop at Kripalu into a long-weekend format. The two extra sessions will allow us to add a second strength-building practice and to explore yin yoga together. If you have been thinking about visiting Kripalu, join us! This is sure to be a fantastic time together. The trails are wonderful, and the lake may even be warm enough for a hardy open-water swimmer. For all levels of athletic or yoga experience; no prior yoga experience required. Athletes are often turned off by yoga because it seems too hard, too easy, or out of sync with their training. Triathlete, coach, and yoga teacher Sage Rountree demystifies yoga and explains exactly how it fits with training and competition. Yoga’s emphasis on form, focus, and breath translates to increased efficiency and enjoyment in your sport and your life. This weekend, learn poses to increase your range of motion and flexibility, especially in the hips and hamstrings. Spend time cultivating sport-specific core strength and balance, examine yoga as mental training, and learn how incorporating yoga’s approach to mind-body integration can make you a better athlete. Practicing the poses and techniques taught in this workshop increases your flexibility, core strength, stability, balance, and physical and mental endurance while lowering recovery time and risk of injury. Weather permitting, we’ll head out for a run one or both mornings, so bring running gear if you would like to join. 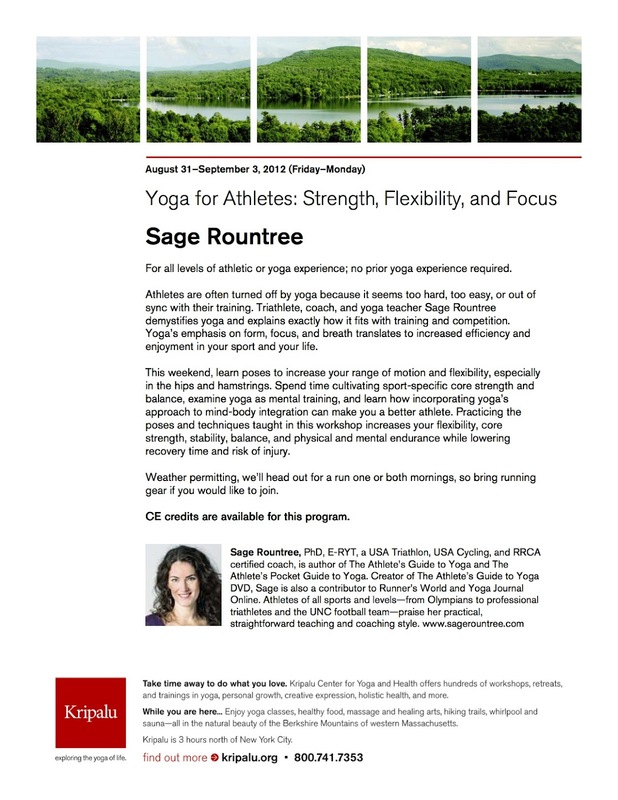 Recommended reading Sage Rountree, The Athlete’s Guide to Yoga and The Athlete’s Pocket Guide to Yoga (both from VeloPress).